UNRWA has opened eight schools to accommodate the evacuees from the northern Gaza. Fearing for their lives, more than 17,000 people have taken shelter in installations of the UN agency for Palestinian refugees, UNRWA, said its spokesman Chris Gunness. Israeli aircraft dropped leaflets on border areas in northern Gaza, calling on the citizens to evacuate their homes before noon Sunday as it prepared to bomb the area. The IDF warned that those who do not obey their instructions will be risking their lives and the lives of their family. UNRWA has opened eight schools to accommodate the evacuees from northern Gaza, said Robert Turner, director of UNRWA operations, during a press conference held Sunday in one of these schools. He said about 4,000 people had already taken shelter in the schools and that the stream of evacuees was increasing. Turner said that UNRWA will open more schools for evacuees if necessary, but pointed out that UNRWA schools can accommodate no more than 35 thousand people. About 50,000 residents of northern Gaza similarly evacuated their homes and sought refuge in UNRWA schools during the IDF's Cast Lead operation in 2008-9. 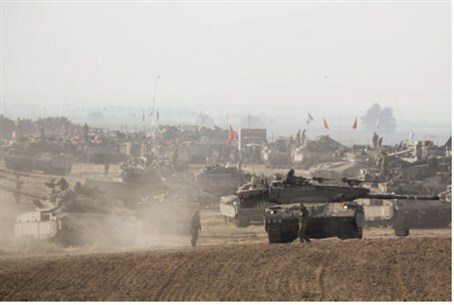 Some calls for a ceasefire notwithstanding, Israeli Prime Minister Binyamin Netanyahu said the military was hitting Hamas "with growing force," warning there was no end in sight. "We do not know when this operation will end," he told ministers. US Secretary of State John Kerry phoned Netanyahu to renew a US offer to help mediate a truce and he "highlighted the US concern about escalating tensions on the ground," a senior State Department official said. The top US diplomat also told the Israeli leader that he was engaged with regional leaders "to help to stop the rocket fire so calm can be restored and civilian casualties prevented". Palestinian Authority head Mahmoud Abbas said he would ask UN chief Ban Ki-moon to "put the State of Palestine under the UN international protection system" in order to address the violence in Gaza. Gaza terrorists have pounded Israel with more than 690 rockets since the fighting began on July 8. More than 150 have been intercepted. Overnight, Israeli naval commandos staged a brief ground assault in northern Gaza on a mission to destroy longer-range rockets, with the army warning residents to leave the area ahead of a major assault on the sector. Speaking on condition of anonymity, a senior Israeli military official said the area was rife with rocket launchers and would be targeted in an operation which would begin during the evening.